When a local radio host asked Montana Senate candidate Matt Rosendale what differentiated him from the other GOP candidates earlier this year, he had a quick response. But his rancher claim appears to be all hat, no cattle. Rosendale, the 57-year-old GOP frontrunner to face Sen. Jon Tester (D-MT), has made ranching a central part of his image as he looks to win his June 5 primary and unseat the two-term senator. 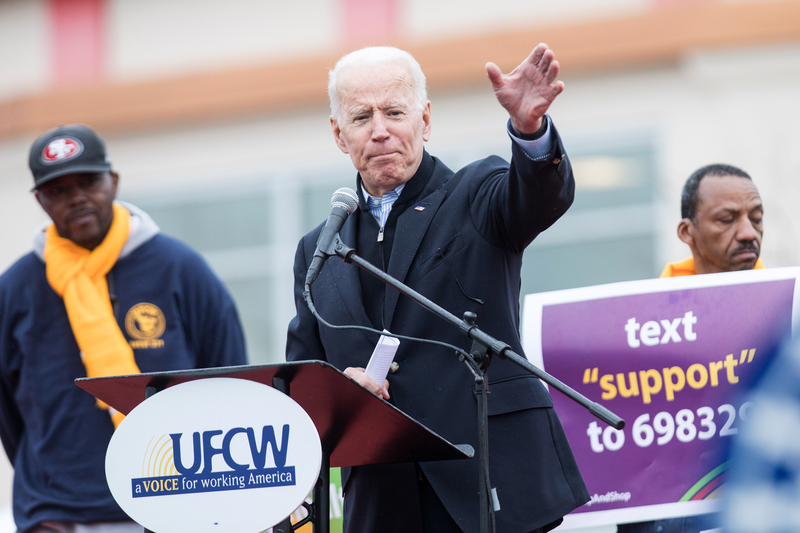 He regularly peppers his campaign pitch with folksy references to his work on the ranch as a way to prove his authentic connections to the state and inoculate himself against attacks that the Maryland native is a carpetbagger. But public records and his own past statements indicate the longtime real estate developer never actually ranched his land himself, instead renting it out for others to farm and run their cattle on. And the higher the office he’s run for, the more he’s talked up his supposed ranching experience. That could be a problem for Rosendale as he looks to hang on for a primary victory next week, as his top primary opponent, former Judge Russ Fagg (R), has repeatedly questioned his roots in the state. “Matt Rosendale may describe himself as a rancher, but I haven’t met many ranchers who were wealthy east coast real-estate developers until they were 40 years old,” Fagg said in a statement to TPM when asked about Rosendale’s ranching credentials. Rosendale is expected to win the race. He has big-name support from Sens. Ted Cruz (R-TX), Rand Paul (R-KY) and Mike Lee (R-UT), and he has had a lot of help in the race from the fiscally conservative Club for Growth, which has been running ads for him and against Fagg. But his ranching credentials could be an issue if he squares off against Tester in the fall. Tester has long banked on his own homespun credentials including his still-working farm and the fingers he lost in a childhood meat grinder accident to put distance between himself and national Democrats in the Republican-leaning state. Parts of Montana have experienced rapid growth in recent years as people move in from other states, to the consternation of many native Montanans, and being a developer could prove problematic for some voters. Montana Democrats have already attacked “Maryland Matt” Rosendale as a carpet-bagger — charges similar to those Interior Secretary Ryan Zinke and others leveled against him during their 2014 House primary. Rosendale moved from Maryland to a Glendive, Montana ranch in 2002 after a successful career in real estate, and still speaks in a heavy Maryland accent. Not too long after he moved to the state he began running for office, winning a statehouse seat in 2010, moving up to the state Senate in 2013 and becoming state auditor and insurance commissioner at the beginning of 2017 after losing a 2014 primary for the U.S. House. During that time and especially in his latest campaign, he’s leaned hard into his rancher persona — while at times avoiding mention of his years as an elected official or discussing his decades in real estate. That includes in his paid advertising, when his time in public office is almost never mentioned. His first Senate campaign ad and website both describe him as a “rancher, businessman, proven leader” — a verbal construction he’s used throughout the campaign. 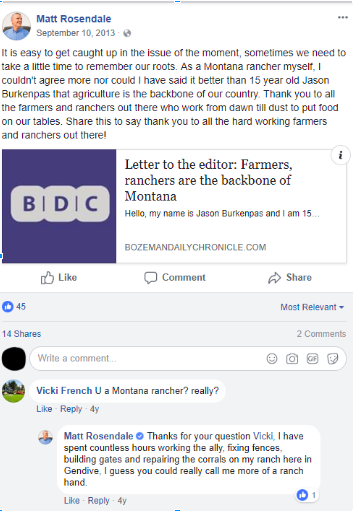 Rosendale has always talked up his Montana ranch connections as a candidate, but he’s done so with increasing force as he’s run for higher office. According to an open records report from the Montana Department Of Revenue conducted for the liberal group American Bridge, Rosendale hasn’t registered ownership of any livestock since 2011 — and before then it was limited to a few horses. It appears that he’s never owned any cattle. He similarly received a registered livestock brand when he bought his $2.2 million ranch in 2002, but let that lapse when it expired in 2011, and it doesn’t appear that he ever used it. 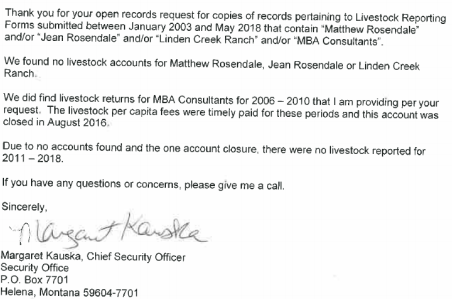 Montana Chief Security Officer Margaret Kauska’s letter to American Bridge in response to their open records request on Rosendale’s ownership of livestock. That makes sense if Rosendale hasn’t worked the land much himself. It seems like leasing out his land been a longstanding arrangement. That didn’t stop him from posing in front of cows and a red barn while wearing a barn jacket — the universal symbol for candidates trying to project folksy authenticity — in his latest campaign ad attacking Tester for opposing the GOP tax cuts. “The Trump tax cuts mean business,” he says in the ad as his campaign slogan, “Matt means business,” is branded onto the screen. Often, his campaign press releases simply describe him as a “Glendive rancher,” leaving out mention of his main jobs. Rosendale has also repeatedly used an almost identical story to describe his work on the ranch. “I’ve worked the ranch. I’ve hauled sugar beets from the field. I’ve PG’d cows in the fall. And I literally have driven T-Posts into the parched each to help my neighbors rebuild their fences after a prairie fire came through and destroyed everything that they had,” he said during the last GOP primary debate last month, an almost verbatim repetition of a line he’s used elsewhere on the stump including in all four of the Republican debates and candidate forums during the campaign. It’s unclear whether Rosendale shot his latest ad on his property or elsewhere, or whose cows appear in the ad. His campaign refused to respond to a series of questions about that, whether he’s owned any livestock, why he started describing himself as a rancher in official paperwork after leaving that off in earlier years, and which cows he “PG’d,” an apparent reference to giving cows the hormone prostaglandin for breeding purposes. “Your ridiculous questions make it pretty clear that you’ve never been to Matt’s ranch in Glendive and you don’t know a cow from a cantaloupe,” Rosendale campaign manager Kendall Cotton told TPM in an email. On the stump, Rosendale hasn’t hid his work as a real estate developer — “I’ve made my career, made money in real estate and real estate development,” he said in one campaign speech last fall. Tester didn’t directly respond when TPM asked if he thought Rosendale was an authentic rancher. Tester told TPM that he had about 100 acres left to plant on his farm as of Thursday because of the late spring — alfalfa, grains, peas, and safflower for oil. Rosendale he opened a recent op-ed with a long anecdote about what Washington can learn from rancher values — while going the entire piece without mentioning his real estate work or that he grew up just hours from D.C. It will be interesting to see if Montana voters decide he’s authentically one of their own.